NEW YORK (Reuters) - A top economic adviser to President Donald Trump said on Monday he expects U.S. budget deficits of about 4 percent to 5 percent of the country's economic output for the next one to two years, adding that there would likely be an effort in 2019 to cut spending on entitlement programs. "We have to be tougher on spending," White House economic adviser Larry Kudlow said in remarks to the Economic Club of New York, adding that government spending was the reason for the wider budget deficits, not the Republican-led tax cuts activated this year. Kudlow did not specify where future cuts would be made. "We're going to run deficits of about 4 to 5 percent of GDP for the next year or two, OK. I'd rather they were lower but it's not a catastrophe," Kudlow said. "Going down the road, of course we'd like to slim that down as much as possible and we'll work at it." He stated that the biggest factor for revenue was economic growth rate. 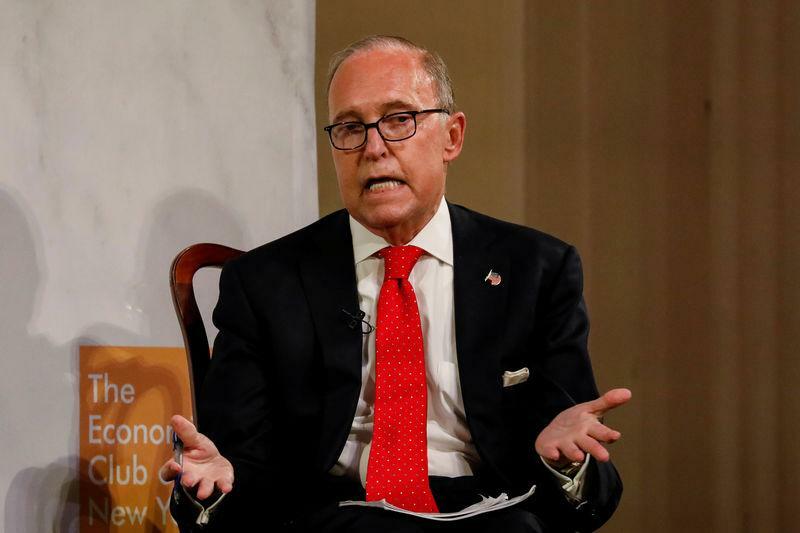 A quicker pace of growth will bring in more revenue, Kudlow said, and that President Donald Trump's economic policies were aimed at boosting the U.S. growth rate. Kudlow also said he did not expect the Congress would be able to make the Trump administration's recent individual tax cuts permanent before the Nov. 6 midterm congressional elections. "I don't think it will get through the whole Congress" before the election, he said, but added that making the personal tax cuts permanent "is a good message" and disagreed with forecasts that they would further increase budget deficits.